17/07/2016 · Take a Zeppelin from Orgrimmar to Thunder Bluff. Then ride to the southern barrens, and ride the rest of the way there. 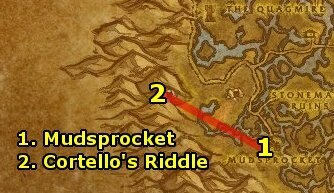 Grab a flight point, and tada, you're done.... 1 Quest item from Uldum that you can travel with. 2 Outside the Orgrimmar gates. 3 Catapults outside Orgrimmar. Fastest way to Dustwallow Marsh is by taking the portal to Dalaran in the Panda capital. When in Dalaran, take the portal to Caverns of Time. From here its a …... ↑ 1.0 1.1 The NPCs listed for Expert level are not true trainers, but vendors who sell the books for the Expert level of training. ↑ 2.0 2.1 The NPCs listed for Artisan level are not true trainers, but quest givers who raise your skill level to Artisan when you complete their quest. 28/03/2014 · From there, you simply jump off the ship and swim to land.... of course, this takes way longer than just going south of Orgrimmar or even the long way on Kalimdor, so only do it if you're really really bored and want to see if you can pull off the sneaky boat thing. how to find cabinet manufacturer The grasslands and mesas of Mulgore rise to the southwest, while the wetlands of Dustwallow Marsh lie to the southeast. The majority of the region consists of vast plains. Mountains to the west hold in heated air, creating the swirling winds that rage across the plains. Stonemaul Ruins. Dustwallow Marsh is a vast and ancient swamp in Central Kalimdor that is home to many old and wonderful beasts. Navigation is often extremely difficult and many adventurers have lost their way in this great morass. Unfortunately, they're still not far enough along in the guide. I started Dustwallow as a freshly dinged level 35, have the heirloom hat and the guild XP bonus (total 20% increase), and was just short of 36 when I reached Tabetha's Farm. If you’re looking for the classic, pre-Mists of Pandaria version of Theramore (for example, if you’re trying to complete Loremaster), look for Zidormi located at the end of the bridge between Thereamore and Dustwallow Marsh. Talk to her to go back to the earlier version of the zone.